Discussion in 'Beer & Food' started by OGRipper, Apr 24, 2008. 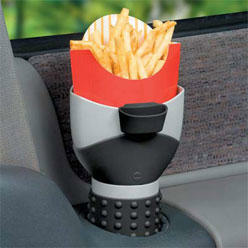 A friggin' french fry holder for your car. Why don't they just skip a step and install a hook for a cholesterol IV?? Didn't they advertise that right next to the handy seatbelt extension and universal extra wide front bucket seat? I'd like to see the hands free version like one of those harmonica holders. Now THAT would be progress. I overheard someone at breakfast today discussing the cup holder attachment for a Fiji water bottle. I was too tired to start a killing spree. I think I can fit a flask in there as well.